The relationship between religion and politics is, to my mind, the central question of our time. As the false totalisms of the twentieth century – communism, fascism, Nazism – have been revealed as oppressive, murderous lies, insecure and inadequate human beings in need of totalist solutions to the human dilemma have returned to religion. But more accurately, they have returned to fundamentalism, because only fundamentalism, with its absolute certainty and literal precision and binding, unquestionable authority, can assuage the anxieties of a world dislocated from tradition, up-ended by capitalism, globalized to the point of cultural panic. What we are seeing on the Republican right at the moment, it seems to me, is an extension of this response to anxiety. The new orthodoxy is fundamentalist Americanism. This is not regular American exceptionalism of the kind that the president adheres to: a belief that this miraculous new world has opened up vistas of democratic opportunity to the rest of the planet, that its inspired constitution has enabled stability and freedom in equal measure, that it played an indispensable role in keeping freedom alive during some dark, dark times, and that its core idea – government by, for and of the people – is universalist in nature. No, the Americanism now heard on the right is that America was uniquely founded on Christianity, that America is therefore a chosen instrument of divine Providence, and that this moral superiority is so profound that indicting America on any prudential, moral or political grounds is un-American or, if it comes from abroad, evil. Go therefore and make disciples of all nations, baptizing them in the name of the Father and of the Son and of the Holy Spirit, and teaching them to obey everything that I have commanded you. 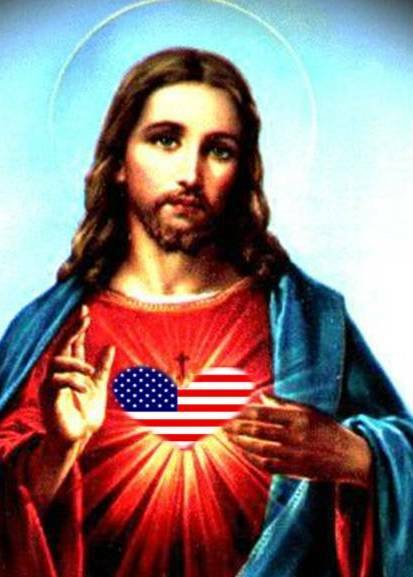 And so the notion of America as a unique nation in the eyes of God is a Christian heresy. And the rest of the current Republican agenda is also, extremely hard to square with Christian orthodoxy. This entry was posted in America, Politics, Religion on June 6, 2011 by Michael Happy.